My first career job was as an agent in the United States Secret Service. I worked in Minneapolis for a year and spent time at the White House protecting President Richard Nixon and former Vice President Hubert Humphrey and then I chased counterfeiters in Chicago for two years.
" I went to work at the Star Tribune newspaper in Minneapolis and stayed for almost 18 years. From 1990-93, I led a 4,500 employee business unit through a transformational change process. SAGE: What question have you always wanted to be asked in an interview? And how would you answer that question? TOM HEUERMAN: How does it feel to be you? My goal is to feel alive. As I continually learn to renew myself and my life, I more often feel energized, enthusiastic, excited, and impatient to live as much of life as I can. 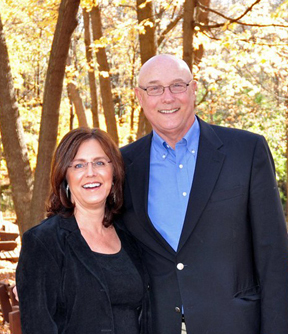 I often feel grateful for how fortunate I am at 67: excellent health, an awesome wife, financial security, great dogs, healthy and successful children and grandchildren, and being able to do what I love to do. Of course, we all have a dark side to manage. I have a few long-held resentments that I work to let go of. I feel sorrow for the awful abuses I see of people, animals, and our planet. I feel angry when I see bad leaders and some of the horrible politicians in power today. I don’t fear death but I do fear at times how and when I will die. As I age, I notice a tendency to get irritated with people. I work to be aware of and manage those emotions. Mostly I feel awful good. What do you want Sage Companion Quarterly readers to know about your work? I’ve worked as a Secret Service agent, an executive and change agent in the business world, as a leadership and change consultant, and even as a carpenter for a year or so─I was a horrible carpenter! The purpose I wrote in the early 90’s was: I live my life as a series of mental, spiritual, and emotional adventures, and share what I learn with others. Today, my work is to write. This is how I share what I learn with others. I am passionate about the process of writing, love the feeling of aliveness I have when I write, and appreciate that writing makes me think deeper and deeper about my subject. Learning to Live: Essays on Life and Leadership is a memoir of the years after I left the corporate world (1994-2013). I wrote the essays in real time and shared them with thousands of readers around the world as I lived my spiritual journey. I used and continue to use my life as my teacher. I updated the essays for the book. I am biased and believe the essays are powerful and inspirational pieces. So- How Would You Describe Yourself in Five (5) Words? And- What is Your Greatest Contribution to the World to Date? I am happily supportive of people who are on their own journeys to deeper authenticity, healthier lives, and spiritual development. They, in turn, support others and our impact grows. 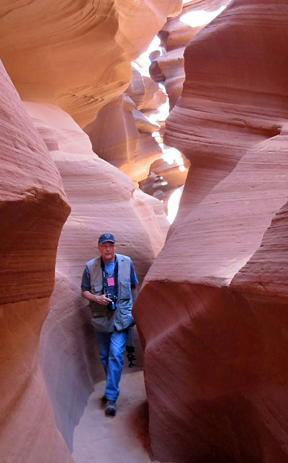 What is, or what do you expect to be the most adventurous thing you have done after the age of 60, 70, 80? I think I’ve learned how to renew my life over and over again so I am always somewhere within a new adventure or resting between peak experiences. I will have adventures as long as I am around and many will be unexpected. That said, Melanie retires this summer and that will change my life as well as hers. We look forward to greater freedom and more time together. We will travel more, I’ll take more photos, and I’ll continue to write. I want to live as well as I can for as long as I can so my adventures in life will continue. In one sentence, what is your best “AGING 501” advice? Stop doing what you don’t want to do and do more of what you love to do. What is the essential thing to remember as one approaches and/or moves into “elderhood”? We are going to die sooner rather than later. Travel boldly on your life’s journey: Do what you want to do today, say what you want to say today, and clean out your closets. And what is your best advice for leading edge boomers and older adults in terms of dissolving negative stereotypes around aging? 7. Don’t wait until the cashier at the grocery store tells you the amount you owe before you begin fill out your check blank. On to the subject of your book, Tom - Who is your audience? People interested in feeling alive, living an authentic and value-driven life, and life’s spiritual journey. People who work in organizations who are interested in higher levels of leadership. How did you get interested in creating work in this particular genre? I loved to study about people and psychology in college and my time in a tough treatment center made the learning real for me. Then I saw how badly organizations are led and how dysfunctional most of them are, and I got interested in leading in new ways. My own use of my life as my own learning laboratory deepened my passion for the topics of life and leadership. I did formal research for my Ph.D. work. My life then became my own source of insight and information. I reflect as deeply as I can on my experiences, what I learned from them, and try to see universal applications for my experiences. I read a lot, stay current on events, and try to see patterns in life. Since I gave up consulting and giving speeches, my typical day is to get up about 8am, do some household chores, get on the computer and read my email, read the newspapers, check my bank and credit card accounts, and then write for a book or my blog. I take a break and walk the dogs about three miles every day, workout three times a week, maybe cut the grass, and eat my meals. I try to read in the afternoon and evening. I watch TV police shows for relaxation. My mind is always going. As Melanie says, I have no “off button.” That’s both good and bad. Melanie retires this summer and I can’t wait. I’m sure my routines will change, we will travel more, and I’ll try to have more fun in my life. What is the best thing about being a creative person? Tossing, turning, flopping, and levitating as I work things out in my gut while sleeping. I am preparing a book of nature and wildlife photographs that I’ve taken over the past 30 years. My mother gave me a deep love of nature and animals─especially dogs. I’ve had a dog most of my life since I got my first one when I was 9 years old. 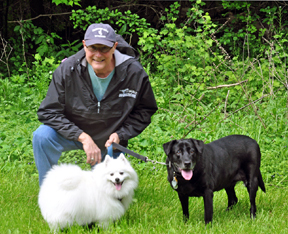 Melanie and I have two dogs: Maddy, a black lab, and Casey, an American Eskimo. I am with them all day and they know my every move, and I know their every trick to get treats. We love them dearly. Traveling would be easier if they could stay home alone and take care of themselves. I worked in a factory the summer before my senior year in high school. I swept floors all day and on two half-days a week I threw customer complaint letters (unopened) into the furnace. The whole experience was awful. I faked an injury so I could quit. I discovered that I liked the quarter system in college: I like to learn something, get tested on it, and then do something new. I hate to repeat the same things over and over again. Once I’ve done something, I want to move on to something new. I was a corporate change agent because I hated to maintain an organization. Once I led change, I wanted a new challenge. As a consultant for 13 years, I tried to renew my approach each year. Learning to Live is an autobiographical work in progress. What are the phases you are covering, and when might we expect to read the next chapter? 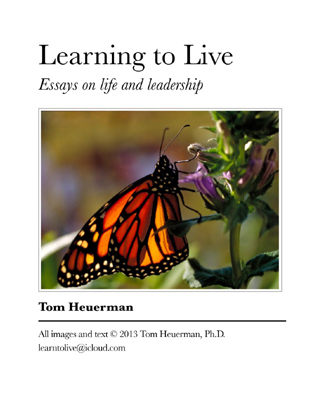 Learning to Live: Essays on Life and Leadership is just out at Amazon.com as an e-book. This book covers 1994-2013─my post corporate life. Some of the essays go back to my Secret Service days and my experiences in a treatment center. Value Driven Leadership covers my career at the Star Tribune newspaper in Minneapolis, MN from 1976-1994, and will be out in a few months. Great stuff Tom! I look forward to reading your articles.